My fascination may come from the fact that rivers seem to have life of their own. Rivers are one of the few forms in Indiana that have not been turned into a geometric form resembling a tick tack toe game. They seem to meander endlessing down the slope from their source to their confluence with another river or ocean. They have along their length such a variety of expressions. Here they are docile and calming. Again they are babbling brooks as they encounter slight interruptions to their flow. On occasion they are angry and destructive forces, inundating anything and everything in their path. Again they may be flowing under thick ice unseen until the spring thaw or until the ice house gang revs up their saws to harvest next summers ice crop. The Indians called the river the ke-na-po-co-mo-co which interpreted means "river of the slippery fish" or "river of the snake fish." A more perfect name might have been the river of warfare. Long before the white man's knowledge of the Eel it had been the line drawn by the Miami Indian tribes as the Potawatomi tribes pushed south through Indiana. At the Eel, Miami Indians had held the line. However, it was an uneasy line that was often breached by war. The river often ran red with the blood of warring tribes. Conflicts with the Potawatomi tribes eventually tapered off. Both the Miami and the Potawtomi Indians enjoyed the French and British traders who traveled the Eel and established trading posts. They brought the goods that made the Indian's life as a hunter more productive. However, not every white man was welcomed, as a new threat began to appear from the east. After a brief battle, General de la Balme took the village of Kekionga, which is now the center of Fort Wayne. He calculated that he had so badly routed the Indians that he could easily replenish his supplies by raiding a British trading post on the Eel near present day Columbia City, IN. He confidently camped overnight east of the trading post not calculating Little Turtle's genius and commanding knowledge of the geography. The Indians surrounded the sleeping soldiers and a with a war shoop moved in for the kill. One soldier escaped to fill in this history for us. strange that the valley would become a place where so many non violent and peaceful farmers and business folk would settle. The river provided so much of what was needed for settling the wilderness. As it was for the Indian it became an important route for movementof people and commerce. Like the indians the settler found the river to be an important source of food. 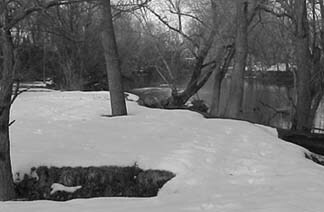 The remains of the Indian fish weir can still be found just down stream from the Laketon access ramp to the Eel. There it appears is one of the few of the early human inroads into the river. The remaining stones suggest that the depth of the river was increased. Wooden poles would have been arranged to trap the fish driven down the river by the squaws and children. The normal procedure would have been to dry or smoke most of the fish for winter consumption. Years later, but not today, a white teen age child might well have been sent to the river at four o'clock in the afternoon to bring home a bountiful meal of fish for supper. The white settlers also found the river to be an important source of power. 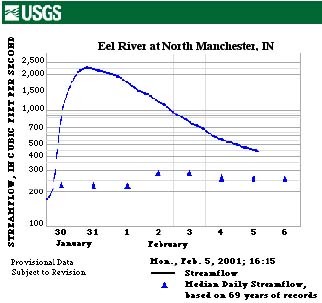 The late Keith Ross had documented thirteen dams along the length of the Eel. The dams before the turn of the twentieth century were generally "timber Crib dams." With trees in such abundance this worked reasonably well. A common procedure seemed to have been to form a foundation for the dam by lining the river bottom with trees with the butts placed side by side and the tops facing up stream in an area of the river where there was a sufficient embankment on each side of the river. On that foundation a timber crib was constructed and anchored. That crib then would be rilled with rocks to add weight and a variety of other material that would hold the water back and raise the level of the river for the fall needed for a water wheel. By 1900 concrete faces, abutments and aprons began to be placed over these cribs. Parts of those old timber dams can now be detected as the concrete has deteriorated after l00 years. 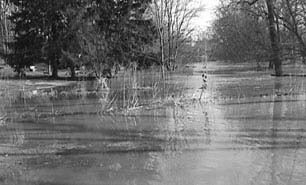 This photograph was taken looking upstream toward the Market Street Bridge about 11:45 am on February 10, 2001, just after the waters began receding from the highest stage level, 10.39 feet recorded at 9:15 that morning. The highest stage ever recorded was 14.81 ft. on December 30, 1990. In order to preserve past history we have an oral taping program organized whereby some of the older citizens can relate the past orally and have such information preserved. Our oldest citizen is Martha Farmer now in her 98th year and living at Timbercrest retirement home. She was a former Junior High school teacher who taught in the old building where the present Central Junior High school is located. Isaac Cripe, grandfather of Jim Taylor, is second oldest citizen. Many residents have reached four score years and several have reached four score and ten plus! Dr, Edward Kintner, a former science professor at Manchester College, has a keen mind and can relate much of the development of the College. It is contact with some of these people which has brought life to the society. Oscar Neher, another former science teacher, has helped to identify some of the antiques in the museum. We hope, in the near future to complete a systematic form of labeling for these items. The system was partially destroyed after a recent move to new quarters. Our desire is to have this museum opened to the general public in the foreseeable future. One of the largest contributions to the group at Fun Fest was our first float given to us by the Manchester Builders who with the help of some sturdy members from the Society created a miniature covered bridge quite in keeping with the bridge centennial celebration. the aid of photographs taken of the original car, plus pictures and descriptions in the company's catalogue found in the local library, assigned himself a job that of reproducing the only local automobile manufactured for only one year 1909 - 1910. For one month he worked on his project and with the help of a few others managed to get the necessary parts for completion. The Historical Society entered the parade last year with more than just a "float" we had a collector's item with a monetary value of $3500. Not only was this a feat of mechanical skill, long hours of labor, and an interest in the past to make it live again in the present but a genuine concern for the community prompted Pat and Pudge to present the car to the Society as a memorial to the late Robert Floyd. The auto will be on exhibit in the building in which the original was first manufactured. Not all the members are able to construct a covered bridge or an auto, but many members have given of their creative talents to better the financial status of the group. Some falling into this list are Allan White, Stephen Batzka, Orpha Weimer, Gladys Scheumann to name a few. The question has been asked of us, "What will the Society hopefully do in the future?" We presume that the group will continue in the path already pursued, to help preserve, to educate the young for a deeper interest in their town, to increase the concern of all for making our community a more beautiful and unique place in which to live and a place where culture rates high. A survey committee consisting of Dr. Bunker, Stephen Batzka and Allan White are planning a survey of the town where all buildings will be listed and the age of each recorded. The procedure for such an undertaking is being guided by the National Restoration Organization in Washington D.C. Early this spring Mr. Clubberson, of the Department of the Interior will be aiding them and will furnish proper registration forms. This is a monumental venture and must be the work of many assisting the main committee of three. ing if we can hope to save this site as a worthy historical spot. We welcome advice and help in any form to assist in preserving it in workable condition for the future. As our Society continues to meet, more and more suggested items of interest and concern are presented. Most societies meet quarterly, semi-annually or annually. A closer and more frequent contact with our membership as a whole produces a more interested and active group than is evidenced in other communities. Thus far, this is a very receptive organization which accepts both advice and criticism with equal consideration. It is our hope that these undertakings can all be successful realities and that more interested people see fit to join themselves with our membership. We welcome all members of the family to join and attend our monthly meetings on the first Monday of each month. The requirements for membership are simply that anyone be over 7 years of age with an interest in making our town a better, more beautiful and more prosperous place in which to live. As representative of the Historical Society we have welcomed the opportunity to review our brief history, our objectives and goals, and our hopes for the future. This is really not OUR Society it is yours, also, since we strive to work for the betterment of our entire citizenry. We might add, that when you carry on your two-day pick-up program each year if you see any throw-away items which could qualify as antique or collectibles REMEMBER the Society is collecting now and will be collecting from now on. Thank you for this opportunity to present this information to you and for your very kind attention. Editors Note: This is true once again as it was it 1974. Check out the news flash on page fourteen. Finally the Society has room to begin collecting once again! Main Street - south side - west to east. 8. Harness Shop - ? 9. Doctor's Office - ? 13. J. B. Williams Drug Store - Fern ? 14. American Express Office - ? 22, South Side Theater - ? 23 Buick Garage (Old Jefferson Livery Barn) George M. Hayes Sr.
l. Monument Works - Roberts ? 4. Store or Lodge ? 7. Morris 5 & 10 Cent Store ? 8. Sporting Goods & Magazine Store ? 15. Burgess Drug Store - Burgess or Horning ? 18. Lawrence National Bank ? 20. Indiana Light and Power Co. - ? 26. Feed Store - ? The North Manchester Historical Society is especially pleased to complete the purchase of the Historic Oppenheim Building on Main Street of the town. We believe this is an important step for the Society and for the Town. Our purpose is to plan a Museum that will be an attractive new asset for Main Street and which will also be an educational tool for the children and the adults of the town. So few children (and some adults) know little of the way of life of their grandparents. The Museum collection which has been held for more than ten years in the Town Life Center has been rather invisible. Now access will be easy and the location much more in the public view. Our first activity at the Oppenheim site has been to create window displays which include historical items. The Christmas display included some of the figures which Oppenheims had used in the past at Christmas time. This week a new display "Think Spring" is being created. A specially chosen Museum Committee is beginning the planning for the remodelling needed in the building, an assessment of the space needs and configuration for the museum area. This is a very large building which may allow for rental of some areas, for ample storage, work rooms and display of large items held by the Society which are now stored in various places. Since there is an elevator we will be able to make good use of all three floors. We have been fortunate to receive a matching grant which we must now match to put this effort on a sound financial footing. Now is the time to renew memberships and secure new ones. Our present members are scattered from coast to coast and there are no doubt others who would be interested in the activities of the Society.. Will you help us let others know about the exciting new activities of this Historical Society? Now that we have ample space we are asking you to contribute your historical materials to our collection. Please check with us.. pieces of furniture.. papers.. Land abstracts, pictures.. Our interests are broad. Things related to N. Manchester, Chester township or Wabash County.